I’ve not had much success growing carrots at the allotment. Last year we planted three different varieties. One variety grew really well but we went away for a weekend and some little critter had a much on them all. My little one was devastated as she had been growing them for Santa – or rather Rudolf. Well poor old Rudolf is going to be in for a little surprise this year when he sees these carrots for they are purple on the outside and orange on the inside. In keeping with our purple potatoes and purple mange tout, we planted some Purple Haze carrots. Of the whole packet that we planted, just a large bunch grew well enough for us to eat. I didn’t want to waste their beautifulness by doing anything other than marvel at them. It had been a real labour of love growing these. They had been potted and left on the windowsill to shoot. Transferred to the allotment in their little eggbox into the soil so as not to disturb the roots. Netted over to protect from the carrot top eating animals that may lie in wait. Watered and weeded almost every week. 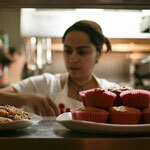 I wanted to do something really special with them to cherish their flavour. I sought inspiration from Pinterest. Some beautiful ideas for soups, roasts and bakes. 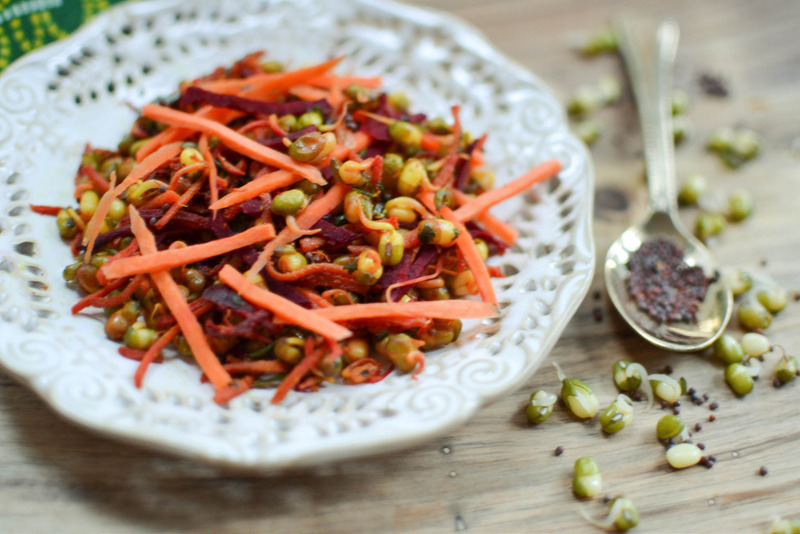 But I decided on this fast Moong Bean and Carrot Salad. Crunchy. Nutritious. Perfect warm or cold. They were so wonderfully sweet. Sadly the purple outer disappears when you chop the carrots up. Add the mustard seeds, let them fizzle and pop for a few seconds and then add the carrots and beetroot if you’re using them. Add the sprouted moong beans, lemon, salt, ginger and all the spices and stir well using a fork. A wooden spoon will absorb all the spices. Stir fry for a couple of minutes to cook off the spices. That’s it. Super healthy. Super fast and very nutritious. I will keep persevering with growing carrots. Especially these beautiful purple ones. Perhaps not on the allotment with my clay soil though! You definitely did them justice and I bet they tasted even sweeter now you have triumphed with them. I wouldn’t have had enough patience for that. Oh yes. I wanted to frame them so I could marvel at them all year! Oh what an absolute shame for your daughter! I bet she loved what you did with the one pretty little bunch not scoffed by the beasties. I do a fennel seed and maple roasted whole carrot dish at this time of year, but you know me and spices, of course I love this idea of yours. It is also making me want to start doing some more sprouting! We grow Lorain purple veg too but our carrots are a bit of a disaster. We grew them in high sided tubs to protect them from carrot fly for a while. They were a bit better then. Carrot fly! Oh no! I don’t know about carrot fly!!! What do the little buggers look like? Never seen ’em! They make burrows through the carrots though. What a super sounding quick salad – love all these flavours. How lovely to grow your own veg too – I try but it never really works. I need to build a proper windbreak! Thanks for linking my soup recipe in your post too. looks wonderful. i just bought fresh carrots here in Tunisia which ‘root’ in a day or two in the kitchen as opposed to UK carrots which never ‘root’ but just get soft and mouldy. Is it because these are ‘alive’ or not irradiated? sorry to ask. 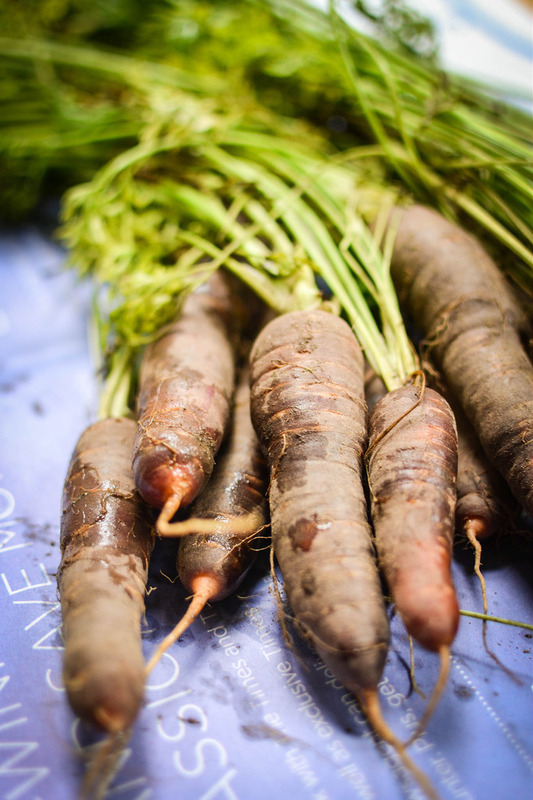 Your carrots look perfect… I’m still struggling to grow the standard orange varieties well, never mind fancy purple ones! The salad looks very good too, with some great flavours in there. I really like this type of salads! it’s very easy to make them and what’s even more important, they are super healthy! What stunning purple carrots! The salad looks incredible as well – so healthy and hearty. Ha! Ha! Bless them. It’s been a real debate in our house as to whether Rudolf will understand they are carrots! Thank you. I must go down this weekend snd see how the winter beans are doing. Thank you! I think planting something so small like a seed and then seeing it burst out of the soil and then bloom into something you can eat is such a complex but simple thing it cannot help but make you happy.